You know the thing about us and product reviews? 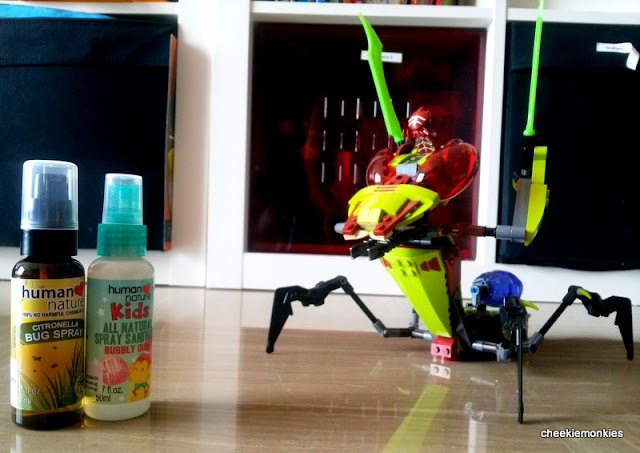 We only review products if it is LEGO-related, or if they are fun to use. So when you get something that actually gives the monkies the perfect excuse to stretch that bath time a wee bit longer, I think it's a no-brainer. Say hello to Human Nature, a natural beauty and personal care line of products that is not only safe for our bodies - natural, organic and 100% free from harmful chemicals - but also safe for the environment. And thanks to them, we got a parcel full of natural goodness! Above all, Human Nature is a passionate social enterprise. The company is driven by love for the Philippines and was established to help provide livelihood for Gawad Kalinga residents and support Filipino farmers by sourcing natural raw material locally. So when you use a personal care product from Human Nature, not only does it feel good on your skin, you are doing good as well. And good was what the monkies precisely felt after using the Kids Natural Shampoo & Body Wash! The 2-in-1 Shampoo and Body wash for kids is infused with avocado oil and aloe vera and consists of a unique Protein Care System with Philippine coco nectar which is rich in amino acids and vitamins to nourish and moisturize both a child's hair and skin. Not to mention that I simply adore the smell of tangy tangerine on them after the bath. If personal hygiene is your concern, then the Kids Natural Shampoo & Body Wash and Kids All Natural Spray Sanitizer are worth checking out. Even the mighty big LEGO bugs cower in fear in front of them, I kid you not. Many commercially available sanitizers and soaps contain Triclosan which has been classified as an irritant and which studies have shown that when mixed with tap water can react with residual chlorine to form carcinogens. The Kids All Natural Spray Sanitizer from Human Nature is Triclosan-free and are clinically proven to kill 99.99% of germs on contact the natural and healthier way. Best of all, it smells like Bubble Gum too! For me though, the Citronella Bug Spray is a god-send. With the dengue fever situation in Singapore still showing no signs of abating, this is one which always goes into the wifey's bag first. And for good reason too, since its all natural, DEET-free formulation spells trouble for all mosquitoes and bugs. Well, that is all good for the kids but how about me? For once, this Daddy was not left out. Human Nature also carries personal care products for Men, which I had the liberty to try out the Pure Strength range - 100% Natural Deodorant, Black Diamond Natural Shampoo with Revitalizing Peppermint, Black Diamond Cleansing Bar and 100% Natural Oil-Fighting Face Wash. The common denominator in these products is the presence of Black Diamond, or Bamboo Charcoal, which is famed for its excellent absorption properties and is one of nature's most powerful deep cleansing ingredients. So what it really means is it acts like a magnet to help me get rid of all the dirt and impurities rather effortlessly. Plus the peppermint feel after usage was liberating too! By now, I know what you are thinking. Being natural, organic and 100% free from harmful chemicals has got be have its price... and worse, prices are bound to be hair-raising ones. The good news is prices are well and truly affordable! I was pleasantly surrpised that the Kids Natural Shampoo & Body Wash cost only $7.90 for a 200ml bottle, the Kids All Natural Spray Sanitizer is $4.90 for a 50ml bottle while a 50ml Citronella Bug Spray goes for $7.90. In fact, Human Nature is committed to reducing the usual profit margins and be affordable so that all can use products that are good for them and the environment. And in doing so, making a difference in the lives of Filipino farming communities too. Do check out the full range of Human Nature products at humannature.com.sg and should something catches your fancy, GOOD NEWS! Human Nature is offering a 15% discount off all products to all our readers! Just key in promo code: HNCM15 upon checkout. The code is valid from now until 27 July 2013 (Saturday, 11.59pm). To receive first-hand news on future promotions, like Human Nature on Facebook or register as a member too. Happy Shopping! I just lathered the hair with the shampoo and it stayed, albeit for 2 seconds! Haha.